So far it looks to be a problem with the Apem Switches, as they aren't available in Mouser until August and they don't seem to be available anywhere else. 1 - "Board 1, The pinout of the noise transistor is wrong. It’s labeled as EBC from top to bottom, but it should be CBE instead. A BC547 will fit with the silkscreen and work well." 2 - "Board 1, The rate slider for the LFO might kill the LFO when it’s at bottom. 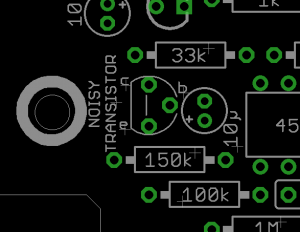 Increase the 470Ω resistor next to it to something between 560Ω and 1k depending on your preference. This might not affect all builds." 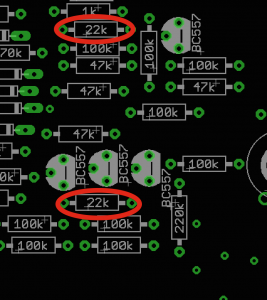 3 - "Board 2 & 3, Four resistors are marked with the wrong value – One 100k and one 47k on both boards. See image for their location." For point 3 - Jon doesn't say which becomes 47k and which becomes 100k, so I emailed him to see if he can update the page for clarity. Edit - ah, *I* was confused [having not seen the actual PCBs] - yes, the printed values are 47k and 100k and these become 22k. The screenprint says 47k and 100k. You should use 22k like the board screenshot. I'm assuming this requires an AC adaptor - what is the spec for that? Also, what's with the carbon film resistors in the BOM? Keeping it as close to the original as possible. ...Well, I believe that is what Jon actually thought when he decided on using carbons'. Anybody found the missing BOM parts in other sites like RS/ Farnell? Mouser is pretty much out of stock on many stuff and delivery dates are like September / October for some! Got my kit through today. What are the missing parts (except the Apem switches mentioned above? The reason I ask is Thonk sell 2N3904 and 2N3906 matched pairs and I'd rather just buy them matched rather than try and match them myself, unless someone can recommend an idiot proof way of doing it. I got the worlds worst shopping experience and some missing caps (UST1H0R1MDD & UST1HR47MDD) from http://www.tme.eu. My kit arrived yesterday. Looking forward to assembling a whole bunch. Not sure about the missing parts as I've not had the chance to even order the mouser basket yet! I've just processed my first order with TME, so.. I was just going to use some I have on cut tape and assume the ones next to each other on the tape are matched enough. Theres quite a lot of space on the board around the matched transistors so it will be easy to swap them out if it needs closer matching. Sorry for being imprecise I just meant that their site and checkout is really hard to navigate. Though, their delivery speed and packaging was flawless! Zthee has built without matched pairs and claims it is good enough. I measured 10 or so from my tape and they were all close enough - so I just used them from the tape and it sounds just like my old SY1 did. True, thats good to know. 4 octaves is more than enough, that's quite good, did you do a side by side with your Original SY? ?